WASHINGTON – The United States Mint (Mint) will begin accepting orders for the 2018 Breast Cancer Awareness Coin and Stamp Set (product code 18CL) on October 1 at noon ET. Priced at $39.95, this set includes one Breast Cancer Awareness Proof Half Dollar produced at the San Francisco Mint and one U.S. Postal Service Breast Cancer Research stamp. 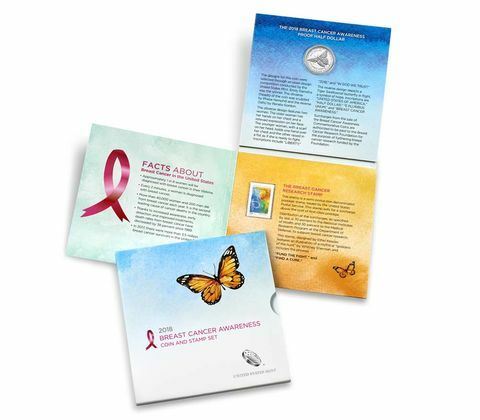 The encapsulated coin and stamp are mounted on an attractive folder with important facts about breast cancer. The folder is housed in a sleeve with the Certificate of Authenticity printed on the back. Orders for the Breast Cancer Awareness Coin and Stamp Set are limited to one set per household. The product limit is 25,000 units.